BERLIN -- For Volkswagen, there are 17 billion reasons why a financial edge over indebted European competitors makes it easier for the carmaker to raise money to finance auto loans, and they all add up to a huge cash pile. At its annual press conference on Monday, Volkswagen forecast stable 2012 profits and said it had net liquidity in its auto operations of 17 billion euros ($22.3 billion) at the end of 2011, compared with fellow European carmakers PSA/Peugeot-Citroen's net debt of 3.36 billion euros and Renault's 299 million-euro debt. 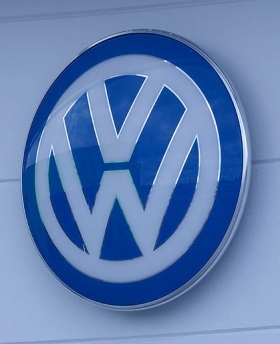 "VW has the opportunity to be more aggressive on financing than the French carmakers because it can raise money cheaper," said Philippe Houchois, a London-based analyst with UBS. "It adds to the brand and cost advantages that VW already has." Auto companies face increasing pressure to finance their own sales, as commercial banks in Europe move to cap their exposure to auto loans because of the region's sovereign debt crisis. VW's financial advantage will make it even tougher for the French carmakers to compete with VW's nine-brand giant. PSA announced plans last month to team with General Motors Co., while Fiat in Italy said the region needs more consolidation to take on Volkswagen. The Germany-based carmaker, which posted record profit last year after selling 8.27 million vehicles, is rated A3 by Moody's Investors Service, four levels higher than both PSA and Renault. That translates into savings when drumming up cash from investors. On a loan of 100 million euros, PSA would have to pay about 2 million euros more in annual interest than Volkswagen, while Renault's financing costs would be 1.4 million euros more a year, according to data from Bank of America Merrill Lynch's European autos index. While Fiat is another level lower than the French carmakers at Ba2, the Italian manufacturer relies on a joint venture with Credit Agricole for its auto loans. "We're in a favorable financial position and we intend to use this advantage in the market," said Christian Dahlheim, head of European sales for VW's financial services unit. "Our goal is to finance every second Volkswagen car sold by 2018, but we don't have a problem if we get there sooner." The unit currently underwrites about one-third of the carmaker's sales in Europe, excluding its home market in Germany, where the rate is above 50 percent. The share of in-house financing climbed from 20 percent three years ago, Dahlheim said. In emerging markets like India and China, where cash sales are more common, the Volkswagen unit provides loans and leasing packages for less than 20 percent of sales, he said. To meet its goal, Volkswagen Financial Services is expanding its offerings. Last year, it began selling extended warranty packages in Germany and France and is considering expanding its insurance offering for commercial leasing clients beyond Italy and the Netherlands, Dahlheim said, adding that insurance for private customers is also under discussion. The cost of insuring Volkswagen's debt with credit-default swaps has fallen 41 percent this year to 102 basis points, according to CMA, a data provider owned by CME Group Inc.
A decline in the contracts, which investors use to speculate on a company's ability to repay debt, indicates improvement in perceptions of credit quality. The price of VW's default swaps compares with 304 basis points to insure the debt of Renault, 470 basis points for contracts on PSA and 767 for Fiat, according to CMA. A basis point on a swap protecting 10 million euros of debt for five years is equivalent to 1,000 euros a year. VW's financing edge should help the carmaker maintain a comfortable lead in the European market, where one in every five autos bought in the region stems from the German auto group, which also sells Audi, Skoda and Seat models. VW plans to spend a record 62.4 billion euros over the next five years to develop new models and expand production. An additional 14 billion euros is earmarked for its ventures in China. VW's European market share is projected to remain steady at about 21 percent this year and in 2013, according to IHS Automotive. PSA, Europe's number two, will probably see its share fall to 12 percent next year from 13.2 percent in 2012, while Renault may increase its share to 10.6 percent from 9.6 percent, aided by the budget Dacia brand, IHS forecasts. Cheaper financing may also help Volkswagen spend less on sales incentives, improving the profitability of its vehicles. Audi and the VW brand had the lowest incentives in Germany in January, averaging 8.5 percent off the list price for Audi and 9.9 percent for VW, according to a survey by industry researcher Autohaus PulsSchlag. Fiat had the highest incentives at 13.3 percent, followed by the French manufacturers, with an average discount rate of 12.8 percent. Renault, which last year exceeded its 500 million-euro target for automotive free cash flow, is keeping pace in terms of matching financing offers, sales chief Jerome Stoll said at the Geneva auto show last week. The carmaker's banking arm has been able to refinance "in a competitive way," said Stoll. "We are benefiting from this offer and are able to pass this to the customers." PSA is under more pressure. The French manufacturer plans to raise 1 billion euros in a share sale, pricing the stock at a 42 percent discount to the last closing level prior to the March 6 announcement. In January, the company said it plans to sell 1.5 billion euros of assets, including property and a stake in its Gefco trucking unit after net debt more than doubled. "The pressure on carmaker finances is evident at PSA," UBS's Houchois said. "The planned asset sale and rights issue are driven in part by an effort to protect its bank. If PSA's credit rating drops further, it risks losing control of the bank. There are no easy buyers out there now." Moody's downgraded PSA to a non-investment grade Ba1 rating on March 1, citing concerns about deteriorating finances. The company's car-manufacturing unit reported a recurring operating loss of 92 million euros in 2011, compared with a profit of 621 million euros a year earlier. For its part, PSA is keen to maintain control of the bank. "The sales financed by our bank have grown and continue to grow," PSA's Chief Financial Officer Jean-Baptiste de Chatillon said in February. "Classic banks are not particularly interested by this business, so we are very confident that our activities in this area will remain a cash pillar for the group," de Chatillon added.